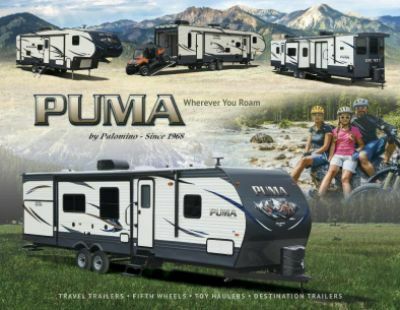 Make your RV dreams come true with the 2019 Palomino Puma 31RKSS Travel Trailer! All Seasons RV is one of America's leading full-service RV dealerships thanks to our huge inventory of top brand RVs, great low prices, and our fast and easy financing! As a top RV dealer in Michigan, our courteous professional staff is ready to assist you with personalized service that is second to none! We're conveniently located at 4701 Airline Rd Muskegon Michigan 49444. Even if you don't live in Muskegon, or in Michigan, we can still help you buy the RV of your dreams! We've got highly satisfied customers all over the country thanks to our door-to-door, fast, reliable delivery service. So give us a call today at 231-739-5269. You'll be living your RV dream in no time! Need some shade when you lounge outside? Pull out the 21' 0" awning with ease! This RV is exceptionally reliable on the road, with a sturdy GVWR of 9625 lbs. This 35' 7" long, 8' 0" wide, and 11' 1" high RV has 2 slides. The 35000 BTU furnace keeps the living area warm on cold nights, and the 13500 BTU a/c keeps the living area cool during hot days. A full day of outdoor fun can work up a big appetite! When the family gathers at the dinner table, they'll be ecstatic at the meals you've prepared for them! The fabulous kitchen comes with all the appliances you need, including a 3 burner range cooktop and a 6.00 cu. ft. refrigerator that can stock all your favorite foods and cold drinks! Cleaning dishes is easy thanks to the 51 gallon freshwater tank. After a full day of dusty outdoor fun, a hot shower can reinvigorate you and wash away the day's grime. 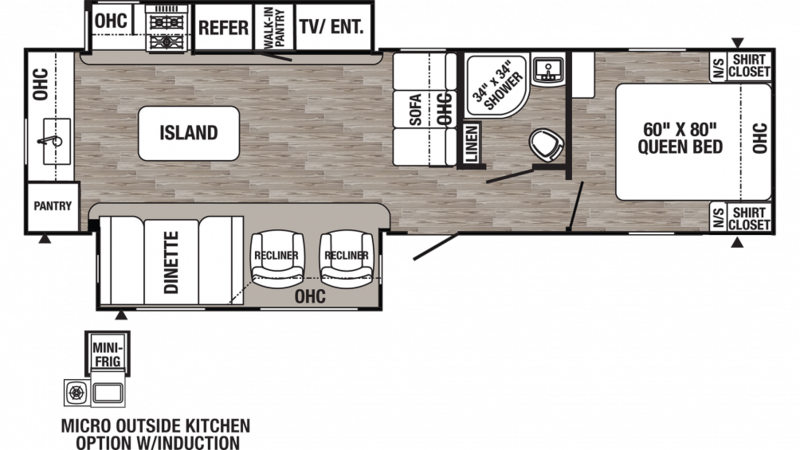 You'll enjoy that luxury in comfort and privacy, thanks to the handsome master bath in this RV with its roomy shower and convenient Foot Flush toilet that's easy to use. With its 51 gallon freshwater tank and 40 lbs. of LP tank capacity, there's plenty of hot water for all! Waste and used water are stored in the 32 gallon black water tank and the 70 gallon gray water tank, respectively.